Industry experts have claimed it is “highly likely” that URE Energy ceased trading in December last year after failing to pay its renewables obligation certificates (ROCs). Writing in a post on LinkedIn, Ian Barker, managing partner at BFY Consulting, said that with Ofgem issuing a final order to URE last month there was an indication it was unlikely the supplier had paid the £209,013.78 in outstanding ROCs. Furthermore last night (14 April) the URE website appeared to be offline, but it is since now up and running. Barker added: “As we advised a number of creditors in December 2018, it was highly likely that URE stopped trading in late 2018 and had sold their customer base. 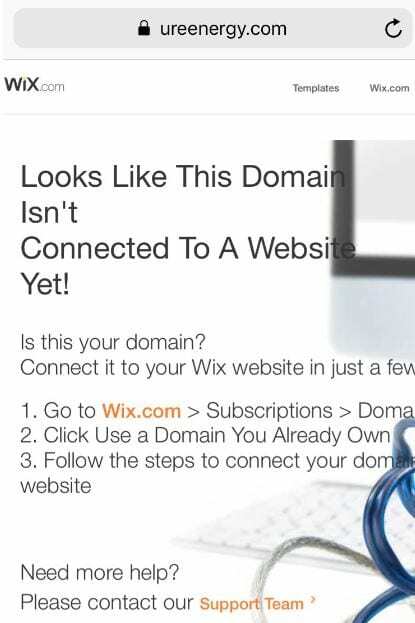 The URE Energy web domain was listed as not being connected to a website in 14 April. URE was given an extended deadline of 31 March to pay its outstanding ROCs payments along with Greater Manchester-based supplier Eversmart Energy. While Ofgem has previously said URE has not paid any of its ROC payments, Eversmart Energy has since announced it has now paid all of its remaining payments. In November last year URE was revealed to be in credit default with Elexon and in section H default under the balancing and settlement code. Utility Week has repeatedly contacted URE Energy for comment but is yet to receive a response. An “unprecedented” 34 suppliers failed to meet their full obligations by the 1 September deadline last year, which resulted in a combined shortfall of £102.9 million in the England and Wales, Scotland, and Northern Ireland buy-out funds (up from £18.7 million in 2017). This works out as an average of £3.02 million per supplier. In November, the regulator announced a mutualisation process would be triggered for the first time ever after the outstanding payments following the final deadline exceeded a threshold known as the relevant shortfall. The level of the shortfall was confirmed at £58.6 million. A number of suppliers named as owing RO payments beyond the 31 October late payment deadline have ceased trading. These include: Iresa, Spark, Extra, Future Energy, Gen4U, Snowdrop, Economy Energy and Brilliant Energy.